For a date full of pampering, Starhill Gallery and the Ritz Carlton combine to make a deliciously enchanting itinerary. Spa Village Kuala LumpurBegin at Spa Village at the Ritz Carlton, where a luxurious haven awaits all who enter. Palms line an aquamarine pool and waterfalls cascade into the depths, gently soothing with the wonderfully peaceful sound of running water. Deck chairs line the edge and beckon continued unwinding after a treatment. Breezy pavilions offer day beds and views of gardens with more ponds and water features. Both couples’ and individual rooms have self-contained bathroom facilities. All resemble mini-villas with sliding glass doors giving access to private garden terraces and outdoor bathing. We recommend signing up for a massage or, if your schedule allows, a couple’s package for a good few hours of indulgence. Either way, save some time for a little lounging by the pool after the session before getting ready for dinner. Spa Village Kuala LumpurFind spa packages and more photos via this link. Fisherman’s Cove – Cozy Table UpstairsRelaxed and feeling great from the spa treatment, stroll across to Starhill Gallery via the link bridge from the Ritz. Head down to Feast Village, the high-end mall’s luxury dining precinct, admiring the architectural cleverness and captivating design of the area as you find your way, to Fisherman’s Cove. The semi-open space of Fisherman’s Cove is cozied with low bamboo ceilings and transparent fishing sails along one wall with a fish tank forming the other. Solid timber tables and chairs are elegantly, yet simply set with curvaceous wine glasses, white cloth napkins and silver cutlery. Cane fishing traps and straw fishermen’s hats act as adornment in this enchanting boathouse and, a small open kitchen allows diners a peak into the busy-ness of food preparation. The most romantic seats in the house though are upstairs. 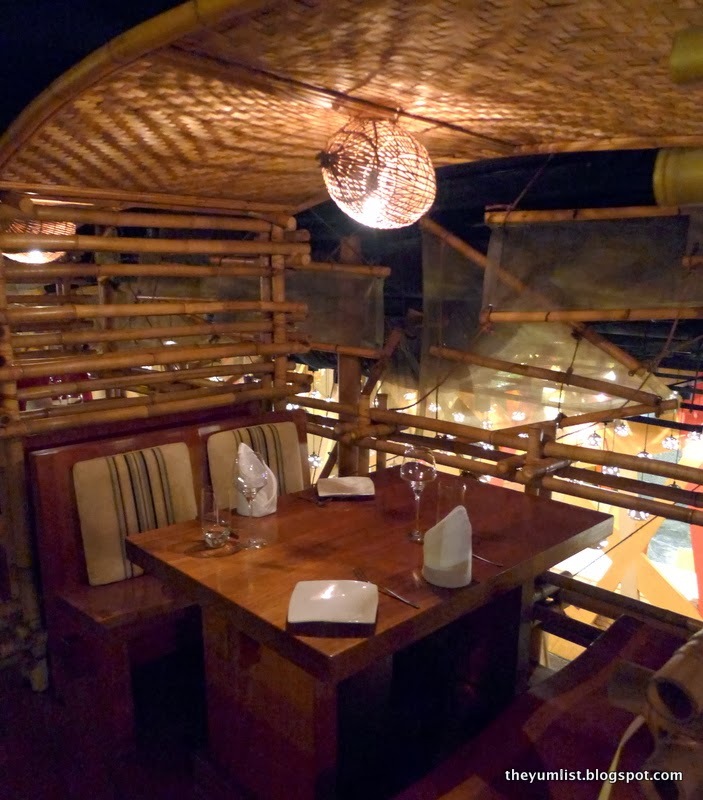 Bamboo mats lower the roof and, lanterns gently illuminate the tables with a warm glow. Bamboo poles scaffold the upper floor forming private booths. It has such an atmosphere of late-evening-in-a-village-by-the-sea that you almost smell the ocean as you dine. I imagine the fog rolling in to the coast, boats bobbing up and down in choppy disharmony and, hear a foghorn faintly sound her warning from afar. Ambience, mood, character – Fisherman’s Cove has it for sure. 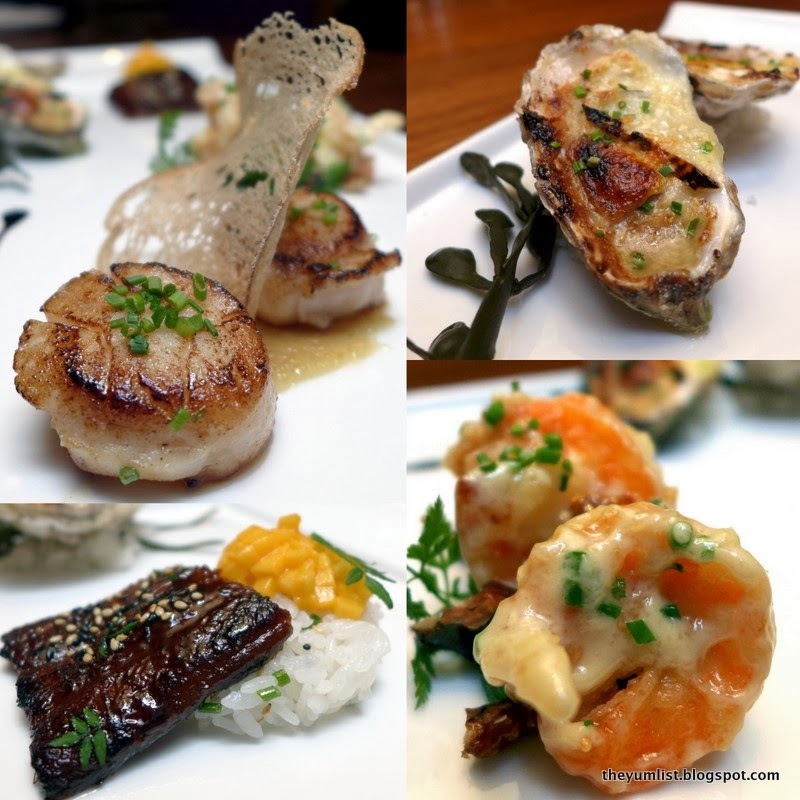 Check out our recommendations of what to order here. Fisherman’s CoveAfter a sumptuous seafood meal, complete the evening with a cocktail or digestif and some live music. Digestifs and Live Music at Shook! Shook! BarJust metres away from Fisherman’s Cove is Shook! Bar. Perched on the upper platform of a split-level, it furnishes guests with an unobstructed view to the central stage, the tables in Shook! restaurant and, the main escalator entrance. It’s a perfect roost for crowd watching. A band plays soft jazz music Tuesday to Sunday evenings until 11:30pm and, in between sets classic tunes from black and white films, both western and eastern, sound the background showering the bar with a lively touch of fun and class. Look here for some fine cocktail suggestions. Attentive Bar Tender at Shook! BarAnd, it is here, the night concludes, or continues as you choose.